The chances are that these days more people than usual will keep their existing car a lot longer than the average 3 year change cycle. So it stands to reason that both franchised and independent garages will be vying for more service and maintenance business from the extra customers this will create. It is reckoned that most new car owners will take their car back to the dealer who supplied them but a far smaller proportion of cars bought used typically go back to a franchised dealer for servicing and repairs. Most makes and models these days benefit from a 3 year warranty from new, and most manufacturers will only validate these warranties if all the servicing is carried out at authorised repairers. Most customers up until this point will use their franchised dealer and when the warranty is up a large percentage of these drivers will flock to their local garages in droves in their quest to save money. It’s not surprising when you consider that some franchised dealers charge up to a staggering £200 per hour for labour and parts can be quite extortionate for some models. Taking the car to your local garage and having them service it can result in a bill that’s a fraction of the main dealer cost, even when that garage buys his parts direct from the franchised dealer. So what are these main dealers doing to attract those customers into staying after the warranty expires and to continue the relationship? Some dealers who now realise the responsibility they have to retain customers and keep the bottom line healthy in the face of dwindling new car sales are looking at ways of encouraging loyalty from what are, let’s face it, their customers in the first place. Fixed cost service plans will certainly help and some dealers will be offering incentives for customers who have had their car serviced at their workshop for the first 3 years, such as getting the next service at half price or certainly at a reduced cost. These measures are certainly a step in the right direction but these dealers need to understand why so many drivers defect to their independent dealer in the first place. Clearly with pennies being so tight every one counts at present, but it can’t just be about money. For instance we took a sample of customers who used their franchised dealer whilst the car was in warranty but who immediately looked to change at the time of their next service and surprisingly price, although important was not always the deciding factor for change. To be fair these are probably fairly standard complaints and many main dealers are now employing advisors who are better trained and often come from a purely workshop background and therefore have a better understanding of the process that happens to a car during its stay there. This will be of greater benefit in the long run and the hope is that it will arrest the flow of disenchanted customers. It boils down to the old adage of not minding paying the price if the service and experience lives up to our expectations. For example you often hear the phrase ”you don’t get a champagne job for beer money” or ”if you pay peanuts you get monkeys’. Well in the case of a car service or major repair you generally can’t see anything for your money, could have spent the same money on several other things that you desired to buy, rather than having to buy and having paid ”champagne” prices, will have definitely perceived the whole experience as ”beer” service. All dealers and repair centres will need to shape up in all aspects of the services and products they offer their customers as consumer choice will now be better than ever. Unless those dealers who do charge eye watering amounts for servicing recognise that customers will not necessarily say anything if they feel like they are being cheated but will generally vote with their feet, then the ones that do adapt will only benefit from the unnecessary demise of the ones that don’t! 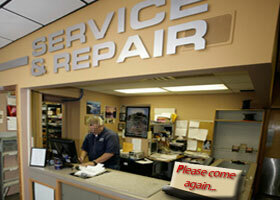 Stay away from dealership service departments! Ford Europe cuts production capacityRMIF talking to Government about the "Car Dealers Bank"